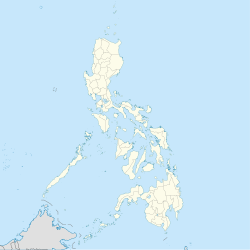 Davao City's land, totaling about 2,443.61 square kilometres (943.48 sq mi), is hilly in the west (the Marilog district) and slopes down to the southeastern shore. Mount Apo, the highest peak in the Philippines, is located at the city's southwestern tip. Mount Apo National Park (the mountain and its surrounding vicinity), was inaugurated by President Manuel L. Quezon (in Proclamation 59 of May 8, 1936) to protect the flora and fauna of the surrounding mountain range. Despite Davao City's location in the Asian portion of the Pacific Ring of Fire, the city has suffered few earthquakes and most have been minor. Mount Apo, 40 kilometres (25 mi) southwest from the city proper, is a dormant volcano. ^ "C.A. No. 51: An Act Creating the City of Davao". The Corpus Juris. 16 October 1936. Archived from the original on 21 April 2019. Retrieved 21 April 2019. ^ "R.A. No. 4867: An Act Creating the Provinces of Davao del Norte, Davao del Sur and Davao Oriental". The Corpus Juris. 8 May 1967. Archived from the original on 21 April 2019. Retrieved 21 April 2019. ^ "Proclamation No. 59, s. 1936". Official Gazette of the Republic of the Philippines. Archived from the original on 21 April 2019. Retrieved 21 April 2019.